There's really nothing you have to have to do DIY projects, but a few key tools and craft supplies will definitely make life a whole lot easier. Here at 2IY life is made easier because Stephanie married a man who just so happens to love tools. I married a man, who, I am lucky can handle a hammer. And so if you are in the same boat as me...you may want to start with a simple DIY Starter Kit. I'll assume you at least have a hammer and a screw driver and that's pretty much it. Okay ready? Let's get started. All of the items are readily available at craft stores like Michaels, AC Moore and Hobby Lobby or the hardware stores including Home Depot and Lowes. To make your life easier I'm going to give you direct links to them on Amazon so they're literally just a click away and in T-3 or 4 days your entire DIY starter kit will be on your front door. 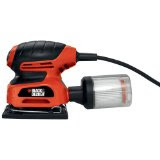 SANDER: This is the Black and Decker Sander with dust filter that I have...whether you get this one or not is up to you, but you really do need a sander for any type of wood or painting projects. JIGSAW: A jigsaw is a DIY essential if you plan to cut, oh let's see, next to anything! 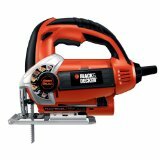 The Black and Decker jigsaw is a good one to start with since it's lightweight, relatively inexpensive, and user friendly. NAIL GUN: A nail gun will save you a lot of time and manicures...just get a nail gun. 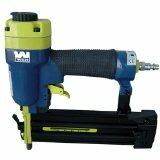 This WEN Nail gun/Brad nailer has great reviews for it's affordable price tag and ease of use. It does require an air compressor to run. CRAFT PAINTS: Get started with a set of craft paints like these high quality satin paints from the Martha Stewart collection. You'll save yourself a lot of time from running to the store to buy a new color every time you need it. Once you discover a color you keep turning to, you can buy a larger quantity. I say having a few key colors of spray paint on hand it also an essential although you'll be hard pressed to find them come in a set. Heirloom White is always a popular color so should be among your DIY starter kit essentials. 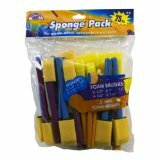 PAINT BRUSHES and SPONGE/FOAM BRUSHES: Having a collection of paint brushes and sponge brushes on hand is always a good idea. Purchasing a set of each will mean you'll have a variety of different sizes on hand for various projects. They can all be washed and reused. 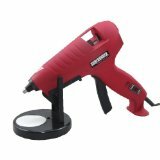 CORDLESS DRILL: A cordless drill will serve you on so many different levels - from easily hanging pictures on the wall or making pilot holes in wood. 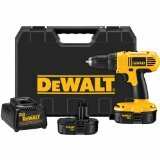 A cordless drill is something no DIYer should be without. Forget the plastic nail gun you may already have, many DIY projects require something more substantial. 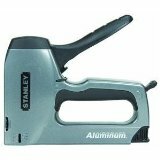 Investing in a heavy duty staple gun like this Stanley will serve you well on a wide range of projects including anything that requires upholstery. 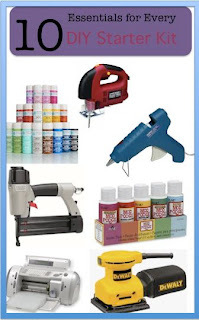 SEWING & DYE CUT MACHINES: Depending on the type of DIY projects you find yourself doing a dye cut machine and/or sewing machine will make your life much easier. Sewing and creating stencils from hand is time consuming and not nearly as efficient when done without these machines. 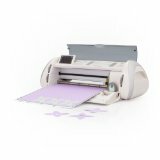 Popular Dye Cut machines including the Cricut and the Silhouette - they can cut paper, vinyls, and other materials into stencils to be used in countless ways. MOD PODGE: Find me a DIYer who hasn't used Mod Podge or isn't a fan and I'll call you a liar. The gluey concoction is seriously genius and can be used in some any different ways to create unbelievable projects. The classic decoupage has been around for 40 years and is still popular because of it's clear dry, easy to clean up, yet high quality results. 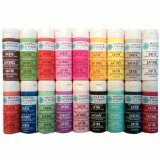 There are five different forumlas and finishes, so the Mod Podge starter pack is perfect for any DIY starter kit. GLUE GUN: A little dab 'll do ya...sometimes nothing works better than to just break out the glue gun and get it done. Glue guns are seriously cheap and they're so versitile which makes them an essential part of any DIY starter kit. What tools do you have in your tool kit that you simply can't live without? We'd love to hear what your must-have DIY tools are. The opinions expressed in this post are exclusively mine and are based on my own experience with the products. I did not receive any compensation from any manufacturers or retailers for this article.